It's Official: Sharing Foundation Raises $100,000 and wins Network for Good Charity Badge/Yahoo Competition!!! 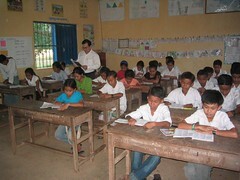 Students in the Sharing Foundation's English Program at Roteang Village. Three weeks ago, using what I learned from my first personal fundraising campaign, I launched a second campaign to raise money for the Sharing Foundation education programs using the Network For Good Charity Badge and entering the Yahoo! For Good competition which would double the amount raised by the winner. At times I am skeptical about web wonkery making any substantive difference in the big picture, but I stand corrected. Second fundraising stint and the effort makes BANK. There's going to be a lot of happy kids going to school now! I spent most of the holidays/New Year offline and am sorry I missed out! For what it's worth I'll kick in my ten bucks, and be sure to plug your next campaign! Thanks for your comments. Since you are in Cambodia, you know! BTW, you can still contribute, we haven't shut down the badge yet ..
Great news, Beth! How cool to know that individual grass roots efforts can result in such amazing collective change. Very inspiring! Beth, that's great, congratulations! I feel like I've seen that particular widget everywhere, nice work. Very cool stuff from Network for Good. On a different note, I just saw your Flickr screencast) (Techsoup's newsletter), loved it! Beth, you are seriously awesome! Thanks so much for sharing so many of the details of your campaigns. It's invaluable info for anyone contemplating putting fundraising tools in the hands of passionate volunteers. Wow Beth, you have no idea how pleasantly surprised I was when I heard about the contest through other channels and found Sharing sitting pretty as the #1 site two weeks ago. I actually heard about it because Worldchanging sent out a plea for folks to give to support them, and I remember thinking "Uh-oh...they're huge, they'll crush Sharing." But you won! We at Interplast talked about jumping in but decided against it, mainly because we were scared of Worldchanging's massive reach (and the 4.75% Network For Good takes of their donations). I guess you're made of stronger stuff then we are. Congrats again. I would be very interested to hear how you managed to get so many donors. How many were already donors on Sharing's list, and how many came to your blog but had no other connection to Sharing before? 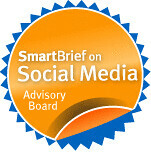 You're an outstanding non-profit fundraiser/marketer, and Sharing is lucky to have you. This is great! I heard about it over at Successful Blog. What a difference you have made. I am an Advisory Board for an interesting non-profit that provides health care for poor and isolated communities in Nicaragua. The Roberto Clemente Santa Ana Clinic http://www.nicaclinic.org staffed by the ever-patient and caring Dr. Julio Flores and nurses Martha Miranda and Carlos Peña, supplies free and low-cost medical care to the isolated villages of Limon, Rancho Santana and 41 surrounding communities in southwest Nicaragua. The Clinic is named for Roberto Clemente, who played baseball for the Pittsburgh Pirates from 1955 to 1972, when he died trying to help the victims of the devastating Nicaragua earthquake. Launched in 2004, the Clinic is the result of generous donations, and also the volunteer efforts of the Rotary Club of Pittsburgh, The Oxford Club, the Granados family and International Living Properties. The Roberto Clemente clinic strives to educate the community on better health, as well as prevent diseases, cure viruses, and treat injuries and the chronic health problems endemic to this part of the world, where running water and flushing toilets are still quite rare. The Clinic's new schedule of 24-hour availability, 7 days a week has greatly increased the number of services we have been able to provide to the locals and visitors of the region.